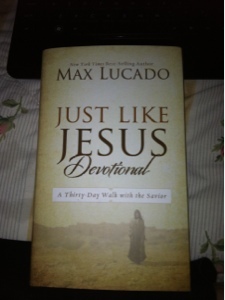 Max Lucado's "Just Like Jesus Devotional" is a 30-day devotional designed to deepen your faith, and encourage you to live your life with the heart of Jesus. The daily devotions in this book are a little bit longer than most other devotionals, but they are definitely worth the extra time. As with most devotionals, each day's reading begins with a short Bible verse that remains the theme for that day's devotion. After the verse, Lucado builds on the verse by relating it to our daily lives - helping to make it easy to understand, and show how it applies to our modern lives. What makes this devotional stand out to me was the section that follows the explanation of the verses. Lucado challenges us through a series of four sections, named "thinking", "hearing", "reflecting" and "thinking". Through these sections, Max Lucado offers personal questions for you to ponder about your spiritual life, and faith. He also offers lengthier Scripture references that tie in to the questions he poses. What I enjoyed was how each section builds on the one before it, really allowing you to soak in the message, and apply it to your own life. Overall I would give this book a 5/5 - Lucado hit a home run with this devotional, and I think that this 30 day challenge would benefit any believer! FTC DISCLOSURE: I received this book from Thomas Nelson Publishers in exchange for an honest review. I was not obligated to write a positive review.